Takht-e Soleym�?n , also known as Shiz or Azar Goshnasp , literally "the Fire of the Warrior Kings" , is an archaeological site in West Azarbaijan , Iran . 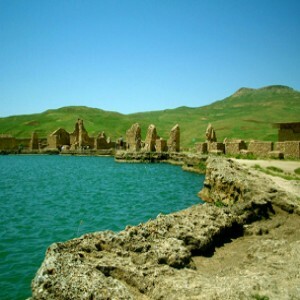 It lies midway between Urmia and Hamadan , very near the present-day town of Takab , and 400 km (250 mi) west of Tehran . The originally fortified site , which is located on a volcano crater rim , was recognized as a World Heritage Site in July 2003 . The citadel includes the remains of a Zoroastrian fire temple built during the Sassanid period and partially rebuilt during the Ilkhanid period . This site got this Semitic name after the Arab conquest . This temple housed one of the three "Great Fires" or "Royal Fires" that Sassanid rulers humbled themselves before in order to ascend the throne . The fire at Takht-i Soleiman was called �?dur Wishn�?sp and was dedicated to the arteshtar or warrior class of the Sasanid . Folk legend relates that King Solomon used to imprison monsters inside the 100 m deep crater of the nearby Zendan-e Soleyman "Prison of Solomon" . Another crater inside the fortification itself is filled with spring water ; Solomon is said to have created a flowing pond that still exists today . Nevertheless , Solomon belongs to Semitic legends and therefore , the lore and namesake (Solomon's Throne) should have been formed following Arab conquest of Persia . A 4th century Armenian manuscript relating to Jesus and Zarathustra , and various historians of the Islamic period , mention this pond . The foundations of the fire temple around the pond is attributed to that legend . Archaeological excavations have revealed traces of a 5th-century BC occupation during the Achaemenid period , as well as later Parthian settlements in the citadel . Coins belonging to the reign of Sassanid kings , and that of the Byzantine emperor Theodosius II (AD 408-450) , have also been discovered there . 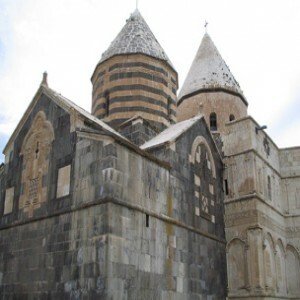 The Monastery of Saint Thaddeus is an ancient Armenian monastery in the mountainous area of West Azerbaijan Province , Iran . Also known as the Black Church , it is about 20 kilometers from the town of Maku , and is visible from quite a distance , due to the massiveness of the church , strongly characterized by the polygonal drums and conical roofs of its two domes .